Does this Manse need a vintage fence along the front of the property? I think it most certainly does! I have nothing against the front yard being open to the street, but a gorgeous fence from the first half of the last century would be a lovely touch. And it’s coming soon! Maple Leaf Fence, by superstar Canadian artist Robert Bateman. Many’s the time since I wrote the post that I’ve thought about dropping a note into the mailbox at that house, telling the owners that if ever they decided to do away with or replace their fence, to please give me a call and I’d gladly take it off their hands. I never followed through – mainly because the fence is so well-cared-for that I strongly suspect the owners love it as much as I do, and would, sensibly, not want to part with this nice piece of vintage Canadiana. A gate at a farm outside Queensborough that has some of the coveted maple leaves. People, “someday” has arrived! I am thrilled to tell you that five-plus years and well over 1,000 blog posts since my first plea for help on finding vintage maple-leaf fencing, I have found my fencing. Would I be interested in purchasing it? I most certainly would! Forty to fifty feet is just about exactly the length we need for a fence along the front of the Manse property. Clearly this was meant to be. So as you can probably guess, one day very soon Raymond and I are going to climb into his little red truck and take a drive that will end with us bringing home 40 or 50 feet of just the fence I’ve been wanting for the Manse. Life is good! That’s a photo of me (at right) and my sister, Melanie, in the gateway that once stood at the end of the flagstone path to the Manse’s front door. On either side of the gate is the fence. Which … does not have maple leaves on it. It is a plain page-wire fence. So that fence memory that I treasure from my childhood must be from somewhere other than the Manse. I feel certain that the maple-leaf fence was somewhere in Queensborough or its immediate area – but I guess it wasn’t at the house I grew up in. But who cares? The Manse may not have actually had that classic vintage fence once upon a time, but it should have. And now, I am delighted to say, it will. My new shade garden, featuring hostas and impatiens, after two sweltering days of hard, hard work. I hope it survives! Did you know that gardening can be a contact sport? No? Well, then you’ve never tried to create a garden north of 7, where fertile soil meets Canadian Shield and the latter generally wins. A little over a week ago I plunged into a garden project I’d been wanting to tackle for a long time, to wit: turning the southwest corner of the Manse’s fairly expansive yard into a shade garden. (It has to be a shade garden because it’s under two very large evergreen trees that, I am embarrassed to admit, I have yet to identify. Tamaracks? I’ll figure it out one of these days.) This particular plot of land was, when Raymond and I bought the Manse, a repository of some years of compostable junk; the raking involved in my first yard cleanup turned up hundreds and hundreds of evergreen cones, along with assorted other things. Having cleaned out that stuff, I enjoyed seeing what subsequently happened in the shady patch, notably a rhubarb plant emerging. My shade garden when it was not a shade garden but a large patch of weeds. In theory, my gardening project was easy: transplant several of the more-than-enough hosta plants that populate the perennial gardens in front of the Manse; and add in some bargain-priced (because it was late in the plant-selling season) impatiens, everybody’s favourite colourful shade bloom. In practice: not so much. What I found when I started digging that corner of land was roots, roots, roots and more roots. That’s pretty much what I find whenever I start digging anywhere around the Manse: this land is old, and the trees on it are too – and thus rooty; and the soil is thin and rocky. It is good for roots. And weeds. And rocks. And maybe rhubarb. Or blueberries. And not much else. After pulling all the weeds and pulling and/or cutting (with my trusty Fiskars) all the roots that I could find on the surface of my garden-to-be on Day 1, and feeling like I might have got the better of the rootiness, I proceeded on Day 2 to try to dig small holes in which to plant the hostas and impatiens. At which point I learned that there are more old roots in a small patch of north-of-7 land than you or I have ever dreamed of. And you know, you can’t do everything. At least, not all at once. So as I tried to plant my wee plants and found little but roots as I dug, I made the executive decision to take my chances with planting the impatiens and the hostas among the roots. I mean, there is some soil there; and, given that the weeds had been absolutely flourishing a short time before, maybe the roots would also cut my new shade plants some slack and let them do their thing too. Regardless, I am proud of my efforts. Proud enough to show them off to all of you. Here once again are some before-and-after shots. Time will tell whether the victor in this project will be the roots, or me and my shade garden. But I am a determined person, and I’ve already put a lot of sweat equity into this project. I’m betting on me. And the hostas. I am just delighted about the heirloom tomato plants that Raymond and I put into our garden early this evening. Don’t they look nice beside the soon-to-blossom peonies (a gift from our Montreal friends Johannah and Tracy) and our bright-red oil tank? It has been another in a string of sunny, hot days here in Queensborough, though today the heat was moderated by a lovely soft wind that had the added bonus of steering the bugs away. As I drove home from work along Queensborough Road late in the afternoon, I was luxuriating in the beauty of the rural countryside. And then I saw the turtle. Regular readers will know that Raymond and I are among the many local residents who do everything they can to make sure the various species of turtles that inhabit our region get safely to the other side of the roads that they are bound and determined to cross during the warm months. I’ve told you before (like here and here) about how Raymond in particular has taken on as a mission the business of helping out the turtles. But we both travel with shovels and gloves in our vehicles – the gloves for picking up the smaller turtles, the shovels for moving the big snappers – and I’ve done my share of this turtle crossing-guard work too. A sight you don’t want to see: a beautiful painted turtle, killed on the road. Poor, poor turtle. I only hope that the driver who struck it did so accidentally and without deliberate intent to harm; I am told (though I hate to think it’s true) that some cruel people actually try to hit the turtles when they see them. I personally hope that those people burn in hell, though I suppose that’s not a very Christian thing to say. I decided that one thing I could do for the little turtle was to get its body to the side of the road so it wouldn’t be struck again and again, and crushed and mangled. What I saw when I turned it over with my shovel wasn’t very pretty, but I gently carried it to the tall marshy grass where it had probably been hoping to lay its eggs, and bid it farewell. And carried on with the rest of my drive back to the Manse, feeling deeply sad. This past weekend, the volunteers with the Queensborough Beautification Committee once again installed hanging flower baskets on the made-in-Queensborough street signs. They are beautiful! Two of this year’s geranium baskets (along with a wasp trap to protect Raymond) on the Manse’s front porch. And the satisfaction of planting (with Raymond’s help) the two heirloom tomato plants – Brandywine and Black Vernissage – and that we’d bought at the Whole Darn Town of Madoc Yard Sale a couple of weekends ago. You can see the results of our planting session in the photo at the top of this post. Also, there was the interesting surprise, as we prepared the ground for those plantings, of a pair of recently shed snake skins! Perhaps Mr. and Mrs. Garter Snake whose acquaintance I made a few years ago have not disappeared after all. And finally, as Raymond and I sat on the front porch post-planting session, admiring our garden and our flowers and pretty little Queensborough generally, came the crowning touch: the first appearance of the year of a hummingbird at our feeder. These tiny things are so lovely, and they seem so friendly. I wish I had a picture of Mr. Hummingbird to show you, but you all know how fast and flitty hummingbirds are. None of these good and happy and pretty things made me forget the sad end of the turtle; but they all – perhaps especially the snake skins, left behind as the snakes enter a new phase of life – reminded me of the wonder of the cycle of the seasons and of the natural world. Death is just a part of that cycle, isn’t it? But so is renewal, and new growth. And the return of the hummingbirds. Life is good. But people, please please please be careful about the turtles when you drive! Isn’t this just the most luxuriant spread of hostas? I know it makes me sound ungrateful (to the people who created this garden at the Manse), but it is a little too luxuriant for me. Time to unload some hostas! I’ve mentioned many times how appreciative I am of the fact that people from St. Andrew’s United Church, Queensborough, planted and maintained a perennial garden for years before Raymond and I bought this old house. The result of that planting and maintenance being, of course, that we have a garden that looks pretty respectable despite my dire lack of knowledge about horticulture and my equally dire lack of time (this summer, at least) to do weeding and maintenance. People, I will admit it: I am tired of hostas. I mean, I get how they are great because they will grow and flourish no matter what the weather or sun/shade conditions are, and no matter what you do (or don’t do) to them. I totally get how people (St. Andrew’s church members) who planted a perennial garden at a Manse where the inhabitant (i.e. the minister) might or might not have the wherewithal to deal with it would install things (hello, hostas) that require zero attention. But hostas do spread, it seems. And while I very much appreciate the green they bring to the northern portion of our perennial garden (where there are several planted, and flourishing), I feel the time has come – well, will have come by the time of next year’s gardening season – to put different things in that garden. Like maybe more phlox, such as I planted this year. And peonies. People, I want peonies! 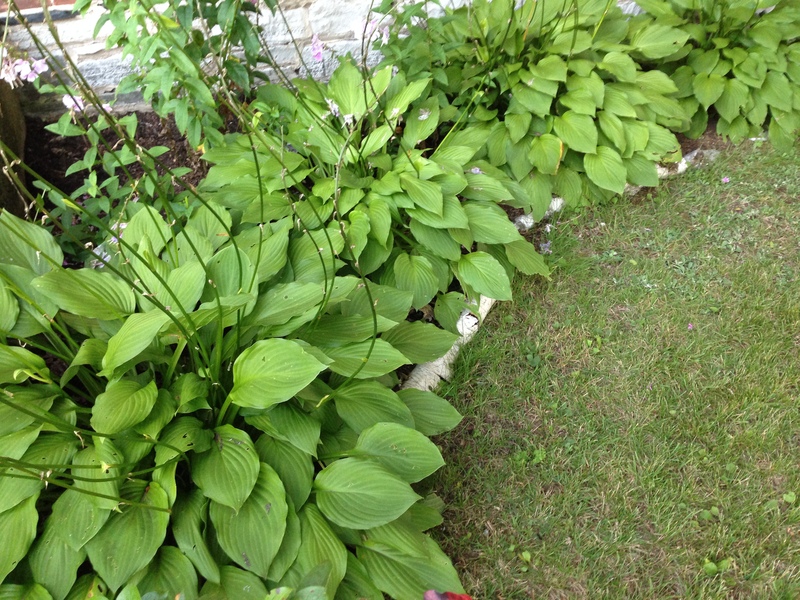 But the hostas are taking up all the space. So what do I do with them? I gather real gardeners (that is, people unlike myself) know how to divide and transplant hostas and other such things. I, on the other hand, haven’t got a clue. And on top of that, I don’t actually want to transplant half an existing hosta plant anywhere on the Manse property. I have enough hostas! So, good gardening friends, please tell me what to do. If any of you who live in the area would like some or all of these hosta plants, you are more than welcome to them. They are very healthy, believe me. And if you don’t – that is, if you yourself have more hostas than you need or want, and I expect that includes pretty much anyone who has a garden – will you give me dispensation to yank them out and toss them? Or – is that gardening sacrilege? Oh dear. I have so much to learn about gardening. And also: so many hostas to get out of my life.